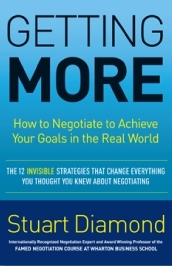 I just read a fabulous new book by Stuart Diamond, negotiation expert and professor at The Wharton Business School, called: Getting More. If you want to get more out of your negotiations, get Getting More today! Professor Diamond outlines, and then explains, 12 negotiation strategies. His rationales are likely to make “hard” bargainers second-guess strategies that may (or may not) have worked for them in the past. At a minimum, adding these strategies to your skill set will broaden your negotiation worldview. Trade things you value unequally. Always communicate, state the obvious, frame the vision. Find the real problem and make it an opportunity. Prepare—make a list and practice with it. If you want to negotiate like a pro, buy the book. Read the book. Improve your negotiated outcomes. And, be sure to let me know how it worked for you! Very hard to get my hand son an idea using those strategy summaries. Guess I’ll have to try the book and see. Is this geared toward sales? Thanks for your question. Negotiations occur all day every day. The book is geared toward all negotiations, with spouses, children, sales people, banks, etc. But I also think these ideas are applicable to civil litigation and claims handling. I’ll be writing more posts about Diamond’s principles, which he teaches to MBA students and executives.